Located 900 m from Bangalore Palace in Bangalore, Hotel Tulip Inn Bangalore features an accommodation, a restaurant and free WiFi. Free private parking is available on site. Some rooms include views of the garden or city. Each room includes a private bathroom equipped with a bath or shower. For your comfort, you will find free toiletries and a hair dryer.There is a 24-hour front desk at the property. The hotel also offers car hire. Indira Gandhi Musical Fountain Park is 1.7 km from Tulip Inn Bangalore, while Indian Institute of Science, Bangalore is 2.7 km from the property. The nearest airport is Kempegowda International Airport, 33 km from the property. This property is also rated for the best value in Bangalore! The Resort provides a number of facilities and amenities to make your stay comfortable. Some of the facilities and services you can avail include room service, baby sitting, spa, restaurant, bar, health club, business center, conference halls, internet connectivity, airport transfers, swimming pool, gymnasium, parking and many more. 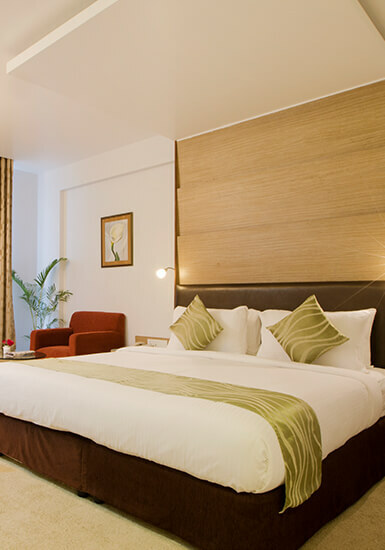 Rooms amenities offered – Tea/coffee supplies, Business stationery, toiletries, Electronic safe. Nearest station is Bengaluru Cantt. and It takes 10 minutes to travel to The Hotel. Approximate driving distance is 2 Kms.